As part of our focus on small producers, Wovember Team Member Tom met up with Louise Spong, founder of South Downs Yarn and Jenny Dean, expert natural dyer, and visited Graham Langford, one of the three shepherds that own the Nepcote Flock of Southdown sheep. Cup of tea warning: make a brew and get comfy, there is much to report back! In this post we’ll concentrate on Louise, and tomorrow we’ll find out more about Jenny’s role in South Downs Yarn. Tom: hi Louise, great to see you today! To start with, could you introduce yourself and South Downs Yarn? Louise: I’m Louise Spong, the founder of South Downs Yarn. We produce woollen spun Southdown wool from the South Downs. 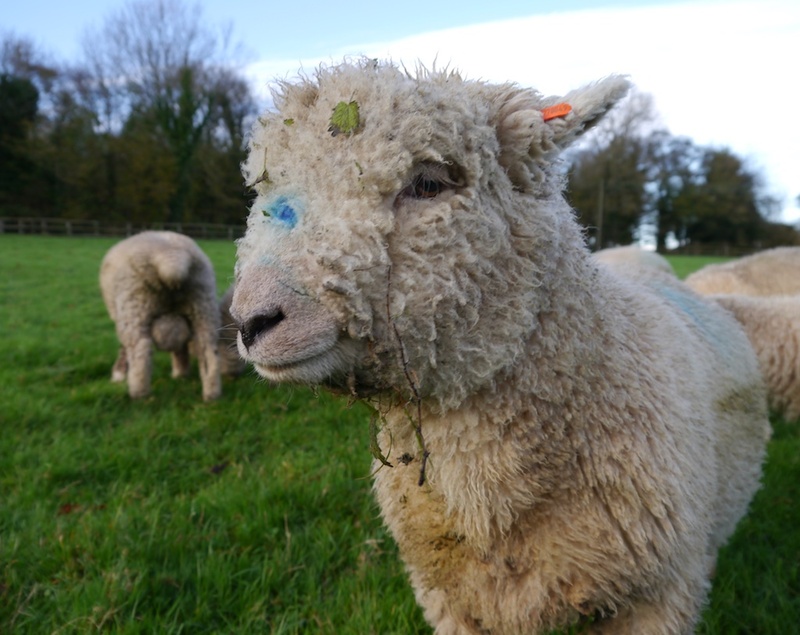 It’s important to me that we distinguish that the Southdown is the breed of sheep and the South Downs is the locality because it can be confusing. The Southdown sheep is popular worldwide. However, we work specifically with local shepherds who look after flocks of registered Southdown sheep that graze in the South Downs locality. All our yarn can be traced back to the flock it came from. The breed, locality and provenance are the three aspects that are essential to what we do. So we are very much a breed and geography-specific company. Tom: How did you get interested in breed specific wool? Louise: it was quite a circuitous route! I first started thinking about Southdown wool in 2006 when I was living in urban America. Being far away from home gave me the opportunity to reflect on what I missed about England, particularly Sussex. Apart from my family and friends, I especially missed the South Downs and Sussex coast. Whilst I missed my familiar landscapes I was also energised by where I was currently living. I learned to knit and crochet in America and loved the abundance of really good yarn stores, the variety of wool available and the creative communities that embraced and experimented with different wool, and who celebrated small farm producers. On my visits home I kept looking for someone selling Southdown wool but there just wasn’t anyone. When I returned to Sussex I kept searching. I finally found The Natural Fibre Company in Cornwall, to whom we would eventually turn to spin our first batch of fleeces. However, I wanted to knit with Southdown wool that had come from the flocks that I knew were local to the South Downs. Tom: and what do you particularly like about Southdown wool? Louise: well, first and foremost it’s my local breed, it also has a fascinating history that is inextricably linked to the landscape of the South Downs. I like to think about all the people for whom the Southdown was and still is important and how fortunate we are to have this fabulous natural resource and the native local habitat available for us to utilise and enjoy. In its heyday the breed was valued as much for its fine wool as it was for its meat. However, the fortunes of the breed, like many others has undergone drastic changes since the 1930s and a number of factors have contributed to its wool becoming devalued. In the UK it is still relatively hard to find Southdown wool for sale as a knitting yarn. This is partly due to a cycle of depreciation. 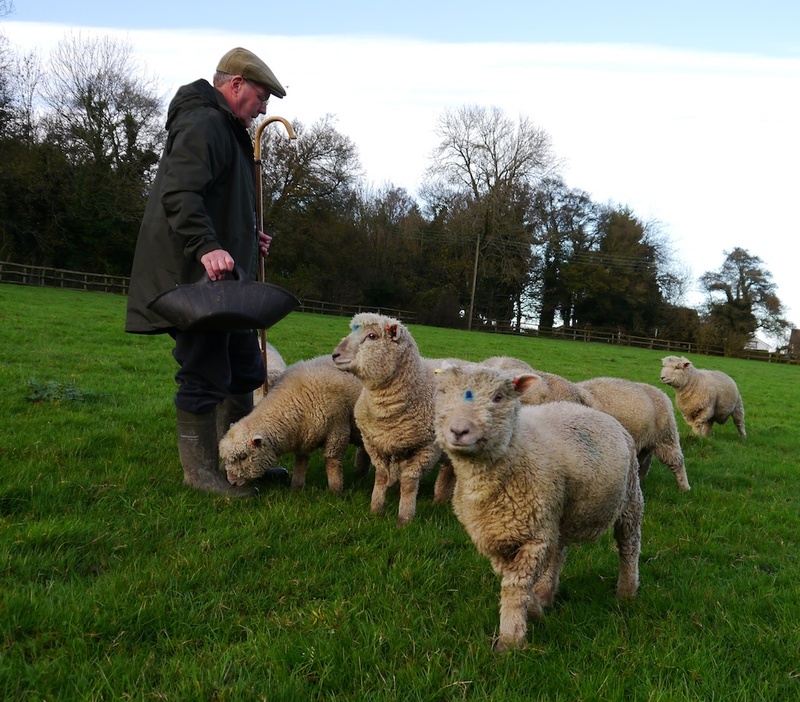 As wool prices fell, some of the more commercial flock owners turned their attention to the quality of the meat rather than the fleece, and this in turn had an impact on the quality and availability of Southdown wool. However, there are still Southdown shepherds not only in Sussex but across the UK and around the world who still value the dual purpose of the breed and are continuing to work to maintain both these qualities. It’s those shepherds and flocks that we want to support. 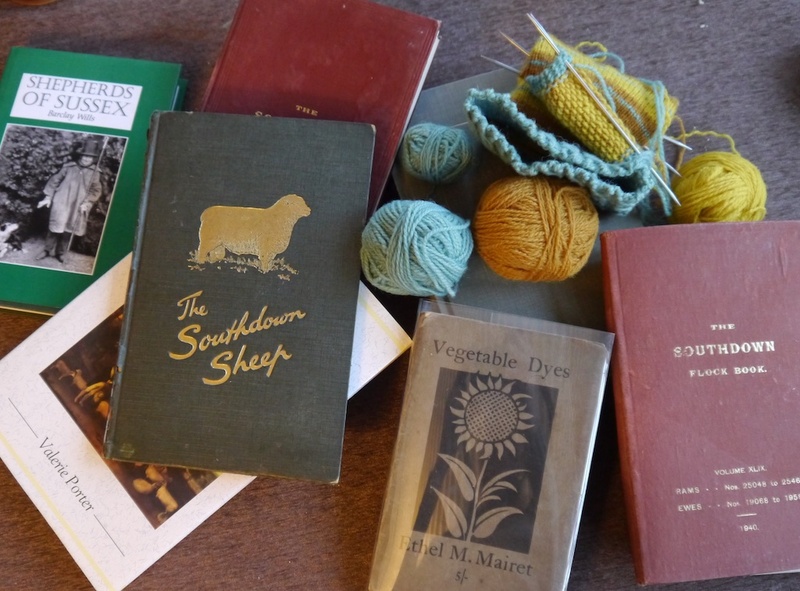 I know that for shepherds like David Burden without whom South Downs Yarn would still be an idea, this renewed interest in Southdown wool and its provenance is not merely heartening, it is also a fundamental part of our ecology. When I collected my first fleeces from David, he told me he’d be thinking of me, with a van full of their fleece, with their hopes and dreams. So, in terms of Southdown wool, at its best it still possesses qualities that distinguish it, although they have in recent decades been largely forgotten or overlooked by all but the most dedicated hand spinners. These qualities include it being one of the finest of the Down wools (in terms of microns between 24-29). It is well crimped and creamy white. The lustre tends to be low to very low which means it is less light reflective and more matt in appearance. I particularly like this quality and find it works well with using natural dyeing, as Jenny will explain later dye plants contain several dye pigments so the colour isn’t flat like many synthetic dyes and this gives our dyed wool a depth of colour. Our initial experiments and swatches showed us that it worked well with stranded knitting. Because it has a short staple, historically it was woollen spun rather than worsted. We wanted to carry on this tradition so all our yarn is woollen spun. Although this means it isn’t a tough yarn when spun it has great warmth because of the air trapped between the fibres. I also value its bounce and versatility due to the crimp and that allows me to work in various gauges without losing stitch definition. It also takes our plant dyes very well and is pretty resistant to felting which also aids our dyeing process. All in all, there are just too many good reasons not to see it being used for clothing rather than compost. Findon lies at the foot of Cissbury Ring, an Iron Age Fort with archaeological evidence of sheep keeping and dyeing. The site is still in use as a grazing ground for local flocks. Tom: How was the breed developed? Louise: we know that by the Iron Age there were certainly sheep in the South of England. Remains from Findon dating from the second to fourth century A.D. are believed to have been descended from Romano-British sheep although interestingly they differ from the remains of finds in other Roman sites, being both broader and longer. Skeletal remains also show us that body proportions and horns were also quite different than in today’s sheep. In terms of the variety and changes in wool over time it is understood that selective breeding through the domestication process rather than environmental conditions has led to the significant differences we are familiar with today. We are lucky to have a range of records that give us details about sheep and more specifically wool, from medieval ordinances to the works of agricultural surveys and travels like William Cobbett’s ‘Rural Rides’ and Arthur Young’s ‘A Six Week’s Tour Through The Southern Counties and Wales’. Gilbert White, a naturalist from Selbourne writing in 1773 also gives us some clear details about Sussex sheep in the mid C18th. He tells us that the river Adur at Shoreham provided a natural boundary between white-faced polled sheep to the west and black-faced polls to the east. The latter is thought to be the forerunner of the Southdown which pushed the white-faced group further west. 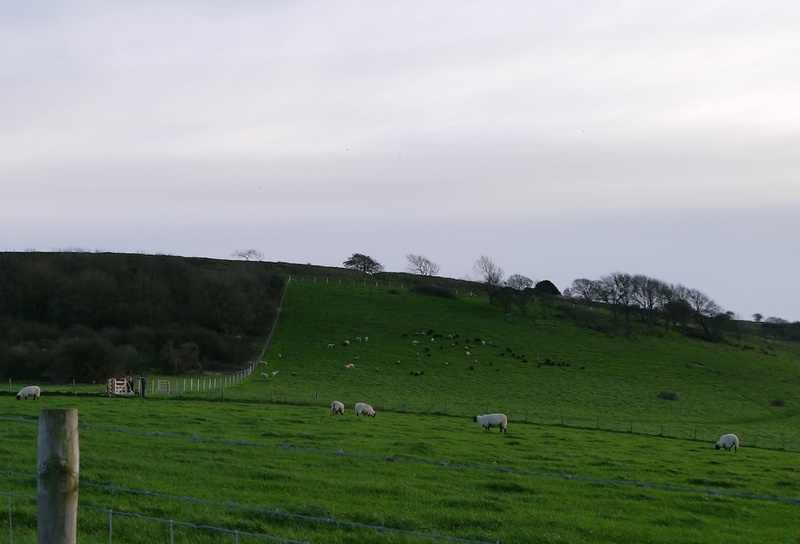 By 1837 William Youatt regarded this boundary to have ceased to exist, showing that the distribution of the types of sheep across Sussex had changed again. We have drawings of these Southdown ancestors and they most certainly didn’t look like the distinctive ‘teddy-bear’ faced Southdowns we recognise today. The beginning of these changes is credited to one remarkable man from Glynde in East Sussex, namely John Ellman. He was remarkable not only because he was not a landowner, but also because he was the first person to start to improve the Southdown breed in a systematic way. Ellman was closely followed by Jonas Webb of Babraham, Cambridge. His flock also gained a reputation for quality and Webb continued to improve the breed, it was so popular in the 1840’s that it started to be known locally as the Cambridgeshire It was one of Webb’s rams that was used by William Humphrey of Newbury in 1839 on his local Berkshire and Wiltshire sheep to found the modern Hampshire Down. There were many other notable early Southdown breeders who were all influenced by Ellman’s methods and vision for the breed’s characteristics. Today’s shepherds and farmers carry on the process of flock improvement. For example, they mark ewes that have had twins or who have prolapsed births, they pick out the best rams, interbreed and import ones to support the flock’s health and vigour and single out ewes with the best fleeces. So that work carries on, day in day out; we’re just not necessarily aware of it happening around us unless perhaps we go to an agricultural show, sheep fair or visit a farm. Tom: I believe the Southdown is also the forerunner of all the Down breeds? It has also been suggested that the Southdown was used in the C18th to improve the Cheviot and the Ryeland. The Southdown was also popular in some areas of France and there is evidence in the first half of the C19th of Southdown influence on the Vendéen, Avranchin, Bizet, Cotentin and Lacaune breeds. Many people will know that Southdowns were also exported to America, Australia and New Zealand where they went on to form great flocks and today are now being imported back to the UK to improve bloodlines. So it’s come full circle. Looking at the influence and prominence of the Southdown from 1790’s to 1930’s it is important to recognise that the last 75 years have been challenging for Southdowns. Flock numbers and registered ewes have declined and in 1987 the Southdown was placed on the Rare Breed Survival Trust’s endangered list. Today, the Southdown has progressed off that list with a small increase in registered ewes, but I still feel the breed remains in undeserved obscurity generally and particularly regarding the value of its wool. Tom: can you tell us a bit more about the Findon Sheep Fair and the Nepcote Flock? Louise: we know that the Findon Sheep Fair dates back to at least 1261 because a Royal Charter of that year mentions it. Like the Southdown flocks that were once driven over the Downs to attend it, the fair has seen many changes and Valerie Martin’s website has lots of information for those wanting to know more. The fair still happens annually right here in this lovely downland village on Nepcote Green. Many villagers volunteer their time and energy to carry on the tradition. I’ve been coming as a visitor since I can remember and I still have to pinch myself that we now attend showcasing our local wool from local flocks. I’ve mentioned David Burden, whose wool from the Duncton flock we used to launch South Downs Yarn, it is also really important to me to mention the Nepcote flock and their shepherds Hari Doman, Graham Langford and Martin Rolph. We spent a wonderful day at their shearing in June this year, and were delighted when one of their fleeces won at the sheep fair in September. We are really excited to say that we’ll be bringing out our second batch of yarn in 2016 from the Nepcote flock. Working with the shepherds is really important to me, and I feel I’m like a conduit between shepherd and knitter. 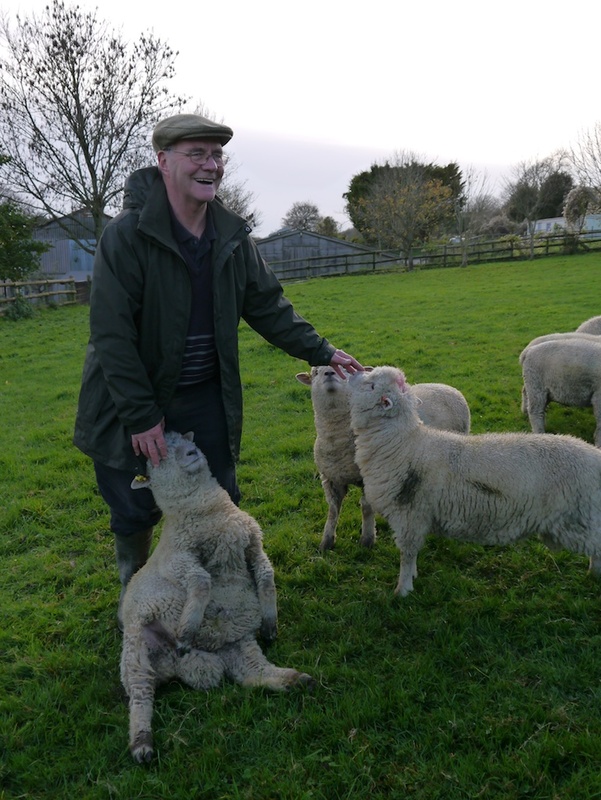 Graham Langford cares a lot for his sheep, and they clearly appreciate it – or perhaps they’re just after another treat! Tom: and where do the flocks graze? I understand that the shepherds don’t own the land? Louise: that’s right. The shepherds I work with own relatively small flocks, about 50-100 animals. They work together with landowners, who will let them graze the land. It fertilises the fields and it makes the landscape what it is. Once upon a time the South Downs were as green as a billiard table, as there were so many more sheep grazing the land and thus shaping the landscape. Tomorrow afternoon we’ll continue with the conversation. 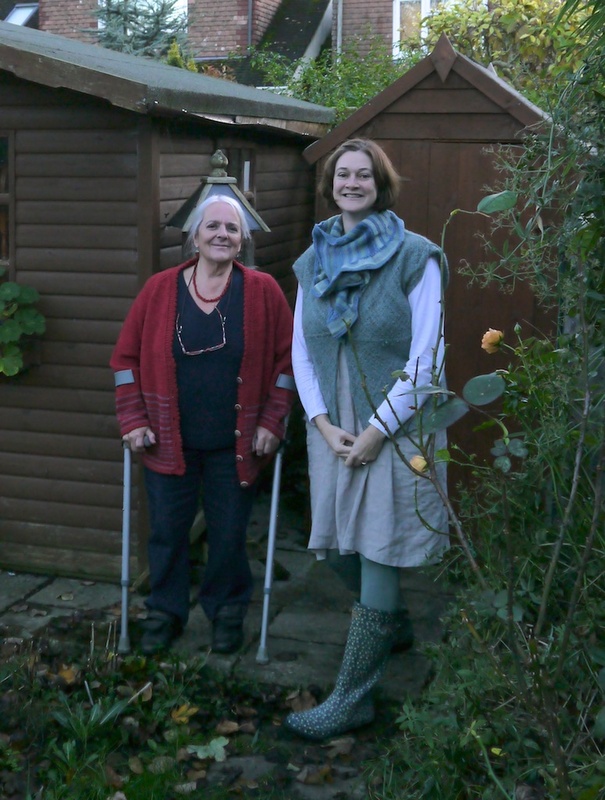 We’ll hear how Louise and Jenny Dean met, and about their choices of natural dyes which gives the South Downs Yarn a beautiful palette to play with.